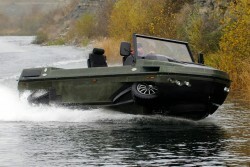 "This 4WD HSA demonstrates that the technology is adaptable for a whole range of applications. It took us 8 years, a million man-hours and tens of millions of pounds to develop HSA technology. With this latest vehicle, I'm sure that the technology's potential is clear for all to see. ", comments Alan Gibbs, founder of Gibbs Technologies. 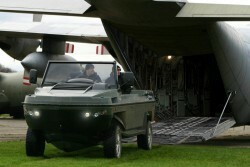 On land the Humdinga can accelerate from 0-60 in 9.2 seconds and on water can reach the 'plane' in less than 10 seconds. It has a curb weight of 2000kg, has all wheel independent air suspension and runs on regular unleaded petrol. 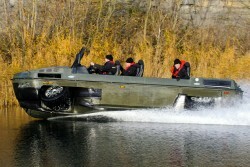 The vehicle is 5400mm in length, 1850mm in height and 2000mm in width.